Machine learning, as with many other topics within data science, involves many skills, tools, languages, frameworks, and more. 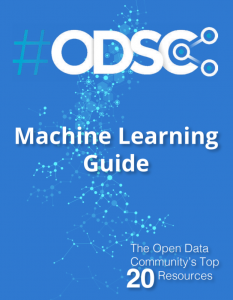 The #ODSC Machine Learning Guide is our compendium of 20 free resources for you to get started with machine learning, including videos from past ODSC machine learning presentations, tutorials, articles, and more. Fill out the form below to have the ODSC Machine Learning guide sent to your email and consider forwarding it to colleagues, friends, and other machine learning practitioners! This downloadable package includes 10 ODSC talks on machine learning, and 10 blogs on machine learning. We also include insights from ML experts on how to get started with ML, mistakes to avoid, and hopes for 2019.